On occasion, people will like the form and size of a painted cupboard, but can’t live with the colour. Your options assuming the paint is not original which is when I would encourage people to learn to love it as it is or let someone who does own it, are to either strip it down and refinish the wood, strip it down and repaint it, or in the cases were the piece is in a stable old oil paint, to simply prepare the surface and repaint right over the last coat. Done properly this approach can be the most natural of any of the processes, and is in fact what happens to many cupboards over the course of their lives anyway. I imagine the scenario were someone decides the old cupboard just looks tired and doesn’t fit in anymore, and the most natural thing to do is to go out to the garage and grab a can of paint you like and away you go. 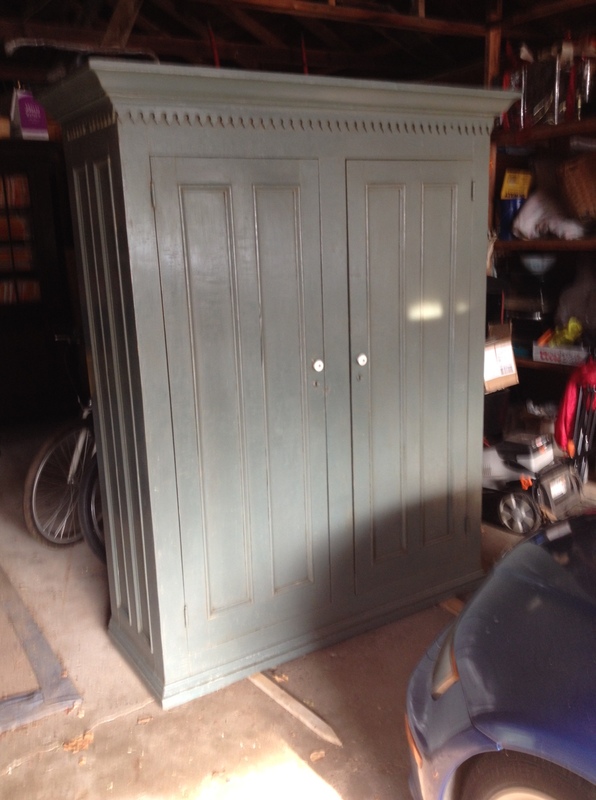 It’s currently fashionable to strip the cupboard and apply a “chalk paint”, and then rub and sand it down in an attempt to look like natural wear. If this is the look you like, go for it, but I think in many cases it ends up looking unnatural. Especially if a cupboard was made in the period after oil paint was invented around the turn of the 20th century, the most natural thing to happen would be for it to be painted in oil. Therefore, if your objective is to make it look good but not “messed with” your best approach can be to repaint in oil paint and then rub down the surface a bit to not have it look too new and shiny. To my mind, this is the most natural and effective way to give a piece new life, and of course it is a lot less work that stripping it. Witness here exhibit “A”. A big old beast of a wardrobe from Quebec made about 1900 of an unattractive Ash wood which was probably painted white as soon as it was made. 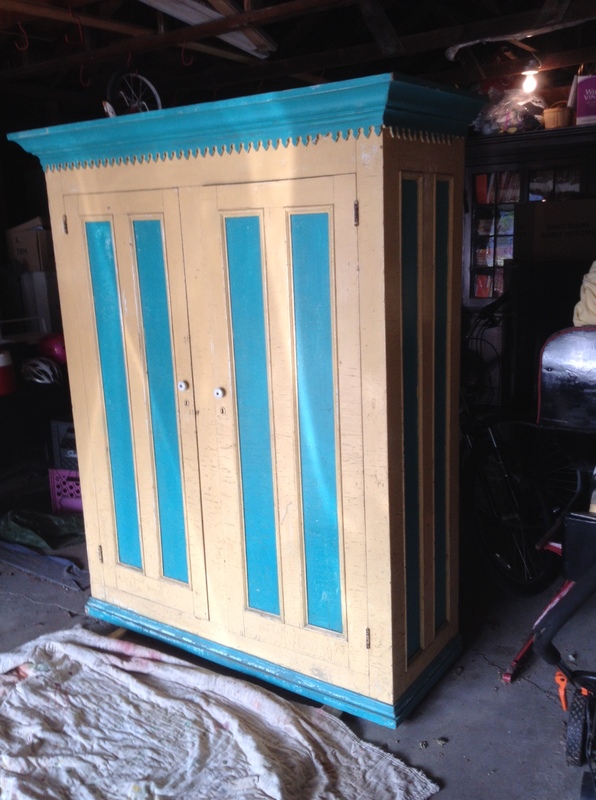 On top of that original white, someone later has painted it cream with a flashy, vibrant blue for the panels and trim. My customer loves the form but cannot live with the bright colour, so has asked me to paint it all in a mid grey which will fit in with the rest of her décor. She prefers that it be all of one colour so it blends in to the room. She gives me a paint sample of the preferred colour. Here in Canada they have decided that oil paint is dangerous and have taken it off the market, so you either take a trip to the states where they are still sensible and allow the sale of oil paint, or find some old stock (I’ve hoarded quite a bit of the stuff), or in this case use the only form of oil based paint still available here which is rust paint. The paint store informed me that this too will soon be pulled from the market. A pity because for one thing all latex “so called” floor paints are total garbage and should be banned. Every time you drag something across latex paint it peals like a balloon and so is quite worthless. 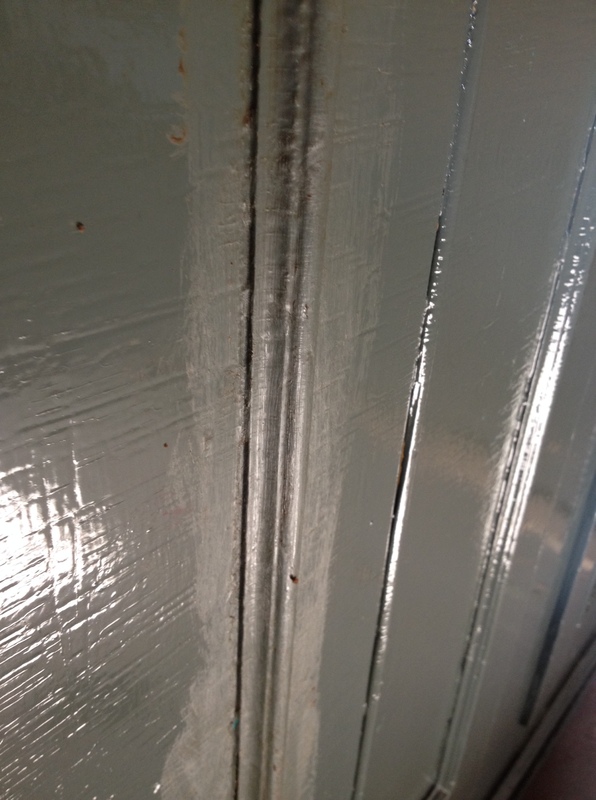 This is the case as well if you use it on your cupboard and try to rub it down a bit to look aged and worn. It just peels off and looks like garbage. I much prefer the old original oil paints as you can get a less shiny surface, but the rust paint works in a pinch and you can tint it exactly as you wish. The first step is to prepare the surface. It must be clean and any loose paint removed. Sometimes this requires some light sanding but in this case, all I did was to brush and rub it down completely with turpentine to remove the dirt and any wax that may have been applied. You can use paint thinner, but for a couple of dollars more I prefer the turpentine. Do this in a well-ventilated area of course. A garage on a nice day when you can have the door open and a fan going is perfect. When it is completely rubbed down and clean you are ready to paint. I thin the paint by about 20% with the turps. I’ll even go thinner if I want a lot of the old paint to show through, but in this case, we want only small areas of the old paint to show. Put an even coat over everything. Then wait a day or so depending on the temperature to let it dry. 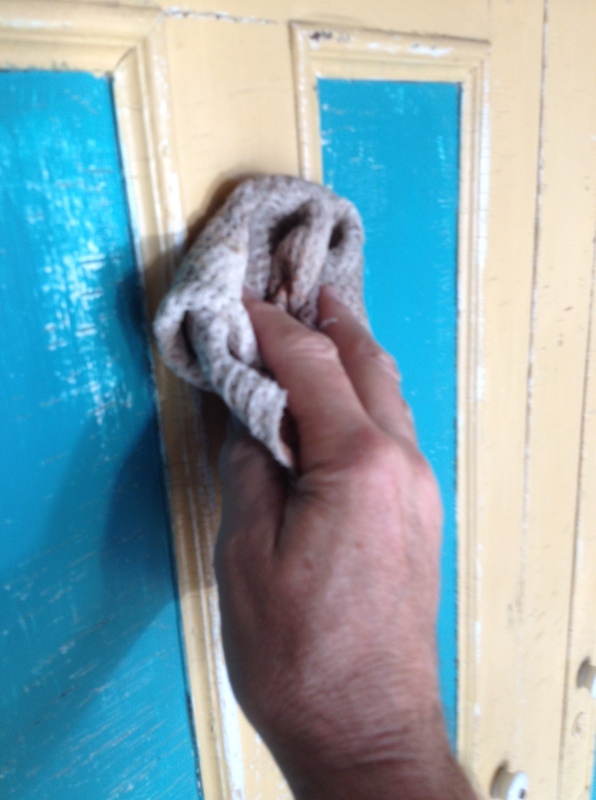 This is the slightly tricky part, because you want the paint dry, but to soften the gloss of the surface and wear it through slightly it is best if it is not completely hard set. A bit of rubbing along the bottom of the side is a discreet place to test. In the case of this cupboard, as the weather was warm it was ready to be rubbed down the next day. It should be noted that you must have a temperature above 50 degrees Fahrenheit or the oil paint will take forever to dry. 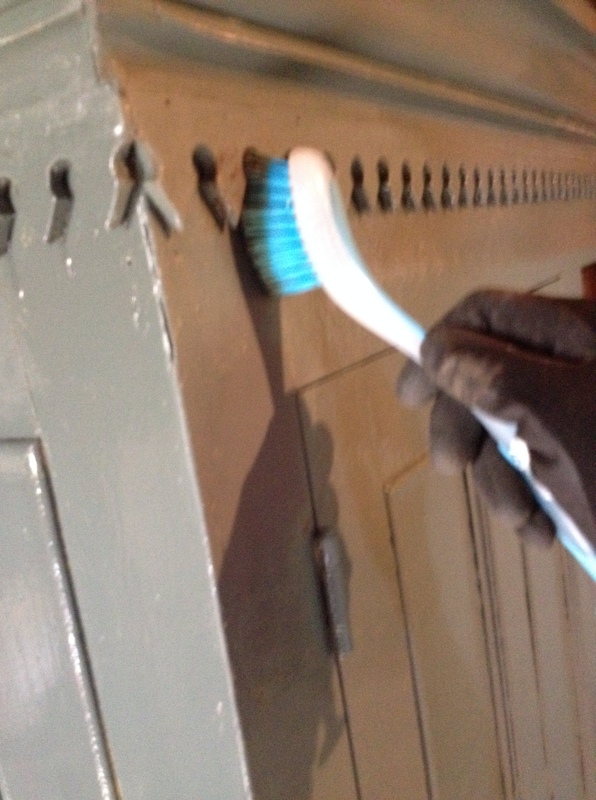 Next, apply a thick coat of Min wax for dark woods over the entire piece using a stiff brush and fine 00 steel wool. You will see that when you rub hard a bit of the paint will come off along the edges and where the under-paint is worn. Take your time and work evenly. Do not attempt to rub through more vigorously around the knobs or in places you think should show more wear as this always becomes obvious. If you rub evenly the paint will naturally come off a bit more in these places. You will note that the dark wax lays in the little creases and accentuates them. This slight dirtiness also gives the piece a more natural patina and softens the overall look. Let the wax dry for a couple of hours and then give it a light buffing with a bit of burlap or an old wool sweater. Not too much or it becomes shiny. When this dries, you are done. The piece may still look a little shiny but let it be and nature will take its course. Over the weeks and months, the surface will settle and age. If you get it right, it’s a good way to bring new life to a piece without having it look done over. One thing that I look forward to when on the road, especially in Quebec, is having breakfast at a little, local restaurant. Typically, we look for the mom and pop place in a small town with a lot of cars in the parking lot. That’s a sure sign because the locals know best. I love walking into a lively room full of morning light and people, talking, laughing, and generally getting on with things. It’s that happy time when you are full of hope and energy before the day has a chance to complicate things and wear you down. It’s all about that first cup of coffee, filling that empty stomach, and getting your communication skills working. In Quebec, on a good day, these places are full of noise and merriment, and most often delicious food. I like to go with the traditional Quebec big breakfast, a couple of eggs, sausage, toast, baked beans, and a little container full of Creton. What is Creton you may ask. Well it’s basically pork fat mixed with bread crumbs, and a little onion and spice, and it is delicious spread on toast. Just the thing if you are going to go out in sub- zero weather to cut down trees. Maybe a few more calories than you need to drive around and search out antiques, but a great way to start the day none the less. I know a lot of people at this point are crying out “cholesterol alert”, but I have a well-researched theory that a small amount of this type of heavy fat is actually good for you. The operative word being a “small” amount, and provided you are active enough to burn it off. Because you are satiated it cuts down on snacking, and your stomach recognizes the fat and puts out the proper enzymes to digest it. Something that doesn’t happen with “low fat” foods, most of which are filled with dangerous chemicals. But I digress. I also love that a lot of these places, although clean, have not been professionally decorated or modernized. It is one of my greatest pleasures to sit, sipping my coffee, anticipating my food and just taking in the local scene. Randomly tuning in on conversations of people you do not know and will never see again makes me feel energized, and connected. At one with the world. When on an antique hunt you are basically driving from place to place, and walking through barns with occasional moments of lifting and loading. So after a big breakfast we then go through the day snacking on things out of a cooler we bring along. This is not only cost saving but satisfying because even the little grocery stores in Quebec have a wonderful selection of fruits, bread, meats and cheese that can be munched on between stops, or if we feel like a break at a rest stop. Not to forget those little packages of delicious cheese curds left out on the counter of almost every little country variety so that they are the right temperature to get every little bit of “squeaky” texture and flavor out. This was then. I hear that now the powers that be have forced the store owners to refrigerate for fear of us becoming sick. Ridiculous. It takes days for curds to go bad. It’s like buttermilk. You can leave it out on the counter and it just continues to be buttermilk for days. The restrictions on raw milk cheese are also ridiculous, but don’t get me started. Finally, at the end of the day it was our pleasure to drive around and seek out a simple meal at some place that looked good and not too expensive. Now days we do a little trip advisor research in advance. It works and saves some gas, but it takes some of the fun out of it. Over the years we have found our favourite spots and we look forward to revisiting them. Eventually we took to carrying two coolers, one for the day to day use, and one for bringing back all the products that we discovered and came to love, and can find only in Quebec. We always make our first stop at a little place on L’Isle Perrot when coming into Montreal on Highway 20. It used to be a dairy Freeze but then one happy day it became Smoke Meat Pete. 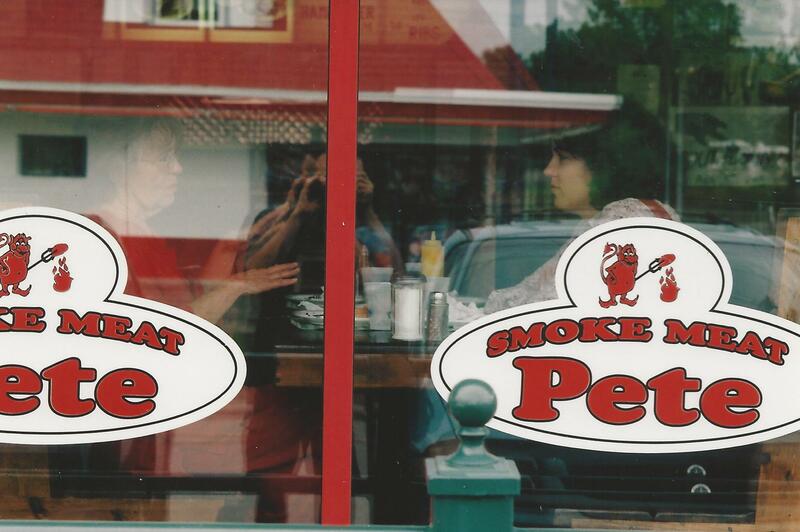 Their slogan is “you can’t beat Pete’s meat” and I heartily agree. Pete smokes his own, and it is super delicious. Second only to Schwartz’s in Montreal and even that may be because Schwartz has the advantage of being the traditional favourite. We always arrive hungry. Have a huge sandwich, and leave super full with a big brisket in the cooler to take home. Yes, gratefully they sell full briskets to go. Next on the tour near the picturesque town of Knowlton lies the giant Lac Brome duck producers. A great source for packaged duck confit legs. Duck confit is a traditional food from Jeanine’s home in the south/west of France and is one of our favourite things, so we usually buy ten or twelve packages containing two legs each, and put them in the freezer when we get home. Then it’s a short drive over to the Abbaye De St-Benoit-Du-Lac, a picturesque monastery on the top of a hill which produces and sells many award winning cheeses. Nearby Magog has a couple of excellent bakeries and specialty shops. You can buy every kind of pate imaginable from rabbit and duck, to elk and you name it. 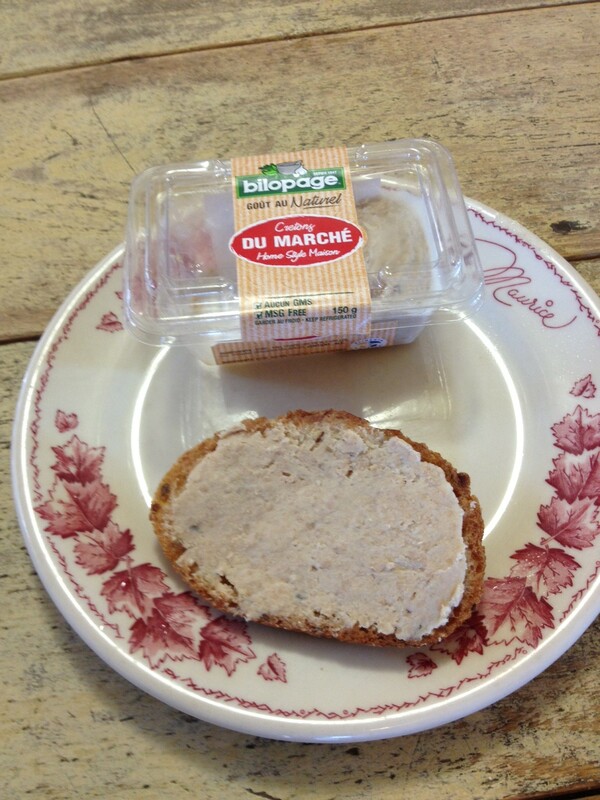 In Magog you can buy over a dozen types of pates while here in rural Ontario you are lucky to find anything other than a basic pork pate with pepper corns. Why is this? Once while doing the Eastman show we found out about a little bakery about six kilometers south of town on Rte 12 that is locally famous for making the most delicious tourtiere you will ever encounter, and the clincher is they sell them for between $12 to $16 each depending on the type. We put as many as we can cram into the cooler for freezing back home. Excellent. When you think of Quebec food, you may think of meat pies, baked beans, poutine, sugar pie and those $2“vapor” hotdog stands with those funny little buns, but increasingly you must also think of world standard cheeses, meats and produce. All this talk is making me hungry. It’s time for me to wrap this baby up and go downstairs, and make myself a sandwich. Bon Appetit. And then there are other folk artists who seek to create a product. Something saleable which will bring in cash. A craftsman’s approach. Some of these people are uniquely talented, and the work becomes very popular in spite of their lack of professional training, or intent. Maud Lewis is a good example. We were driving along Rte 138 on the north shore of the St Lawrence near Trois Rivieres Quebec, when we spotted a sign for a yard sale. We are talking about the 1980’s when it was a good idea to check out all yard sales. It was early on and there were still lots of good things coming to light. 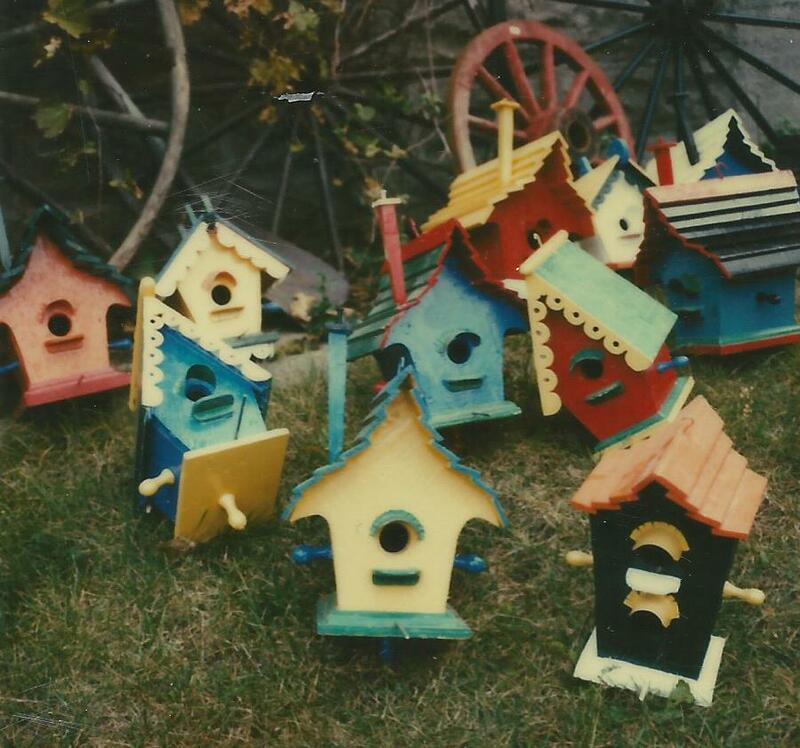 So we pulled in and became immediately drawn to a few odd looking, hand-made bird houses sitting under a tree. Really cool, looking like something out of Dr. Seuss. They were unpainted and a little rough around the edges, but you could see the potential. Jeanine asked in French, “Can you tell us something about the birdhouses please.” An elderly gentleman came over to us and explained that he had made them in his little shop out back just to keep himself busy. Then he started quoting prices, all of which were reasonable. “I see you have six out here on display. Do you have others?”. He smiled and said “come with me”. We found ourselves in his back yard, behind a small barn and there sat what looked to be an old two-seater outhouse. 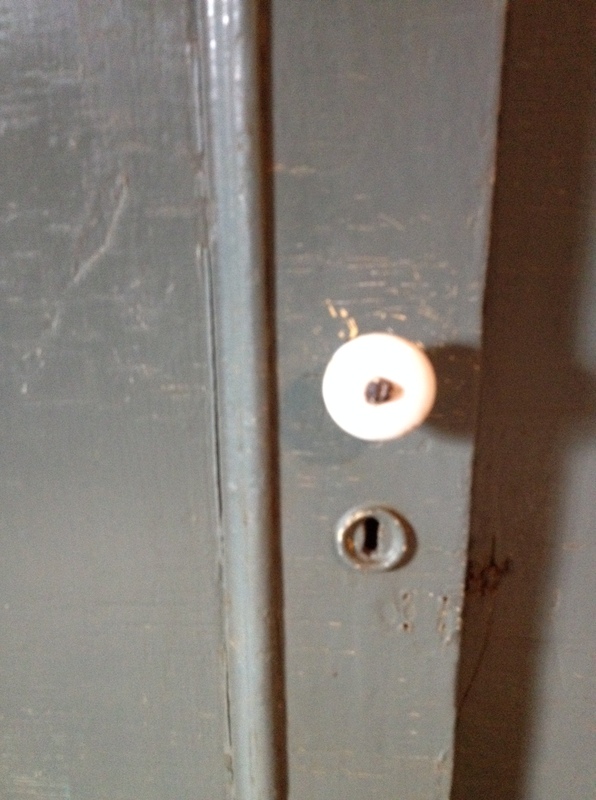 Door latched shut with a stick of wood. 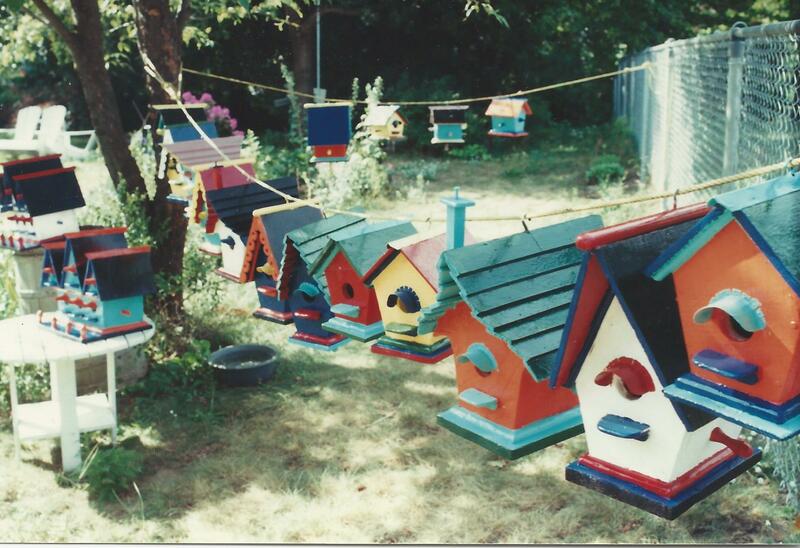 He swung open the door, and taa daa, the entire space from floor to ceiling was stuffed with birdhouses. There had to be 100 or so in there. He grinned, “You see I have more. How many would you like?” We excused ourselves for a moment so we could have a quick huddle, and then Jeanine asked “Well what do you want for all of them?” His eye’s lit up and he said without hesitation “Take them all and pay so much a piece no matter what the model.” I honestly can’t remember the exact price, but it was extremely reasonable, say $15 each. Deal. I drove the pick up right to the outhouse and we began the arduous task of unloading and reloading all those birdhouses. They filled up every bit of space we had left, and when we were finished there was so much rope holding everything in place that it looked like a spider’s web. We were full at this point so we headed home, feeling quite giddy. 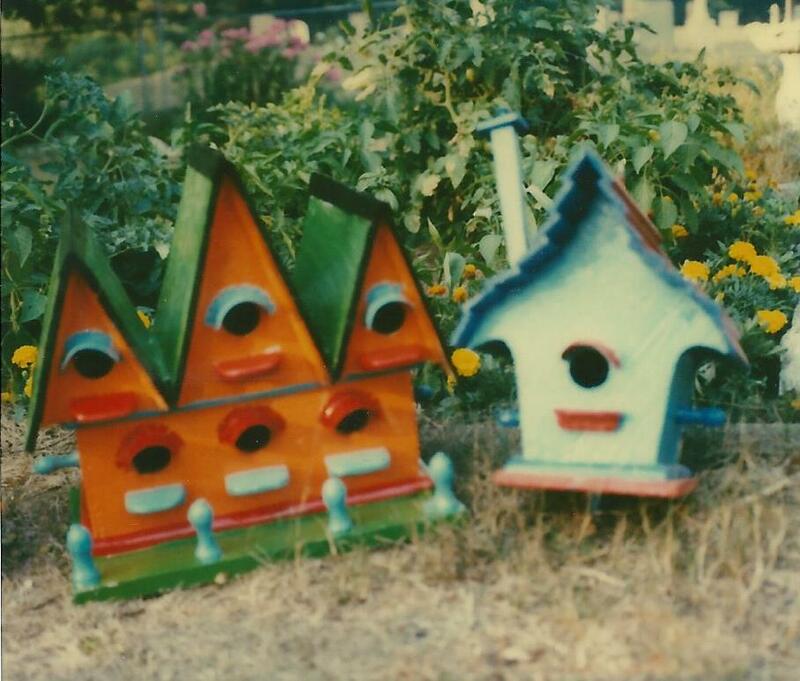 It was summertime, and our daughter and three of her friends had just discovered what a drag picking strawberries was as a summer job, so we offered them the job to sand, prime, and paint all those birdhouses. They set up at the picnic table under a big tree, cranked up the radio, and started to work. We provided paint, brushes, sandwiches and beverages and paid them by the piece. They were happy, and we were happy with the excellent job they did both in the quality of the work, and their choices of bright colours. We loved to look out and see more and more brightly coloured bird houses hanging from the cloths line, and hearing the happy chatter from the work team. It lasted over several weeks and we sold them just about as fast as they became available. Eventually they all had new homes and we contemplated a return trip to see if more had been made, but never got around to it. We thought that with all that space available in the old outhouse and after such a successful sale, our maker friend would probably get right back to it. We never did find out. I still see them from time to time at antique shows. 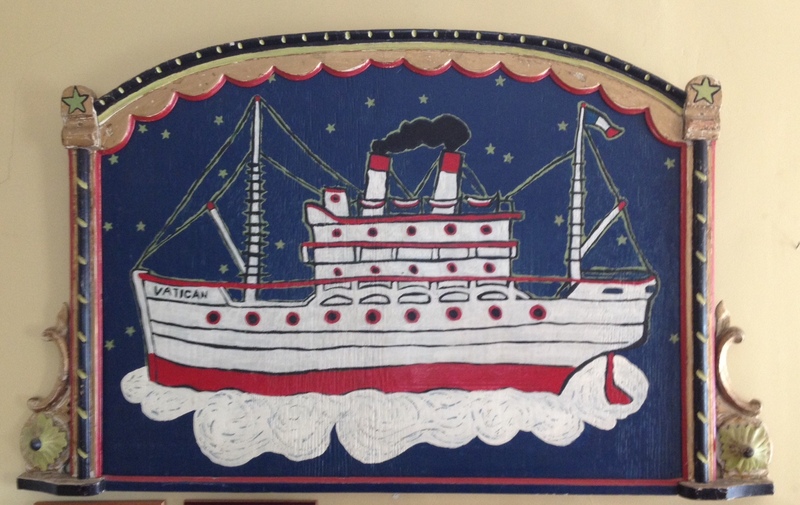 When it comes to selling folk art, something you learn pretty quickly is that size matters. In this case, small being better than large, because not many collectors have a large amount of space to dedicate to their interest, and so although they may be delighted to see a large piece, not many of them are going to take it home. The exception being things like totem poles or other vertical forms that don’t take up too much floor space., or can go outdoors. Even then it has to have a lot going for it, or you risk hauling the thing around from show to show like a giant albatross around your neck. That being said, it’s good to have something spectacular for a show like Bowmanville, where you focus on building a reputation as well as sales, and big and flashy gets them into your booth. This is why on the rare occasion when I did find something large that made my heart skip, I found myself drifting from ”isn’t this an interesting thing. I’m so happy to have experienced it and now I have it to remember”, to “I wonder if I can Squeeze this thing into the truck and when I get home convince Jeanine it is a good idea.” It’s a feeling recognized by elements of excitement and danger coming rapidly in equal amounts. It was early spring and the hope brought on by new life and growth was thick in the air as I pulled in to Jean Deshaies or as he is known “Kojak’s”. I was flying solo and with a full truck, so it was a last look in case of an interesting small or something worth putting aside for next time. I could see that Kojak was excited when I walked in, and he jumped right up and hurried towards me, “ Phil, you’ve got to see what just came in. It’ll blow your mind”. 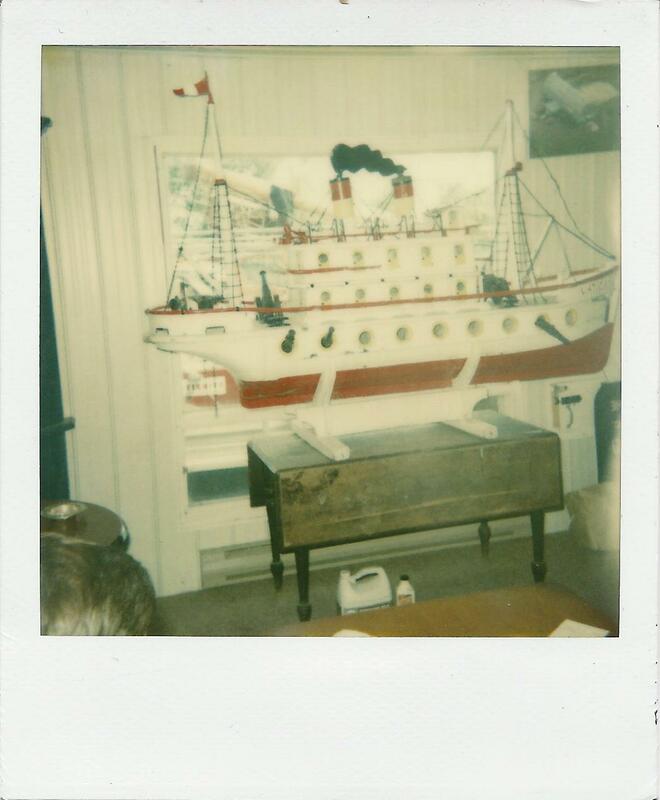 He brought me into his small front room where he kept his special things and there perched on a table in front of the window was a spectacular 7 foot long, 4’ tall, red and white, three tiered birdhouse in the form of a ship. 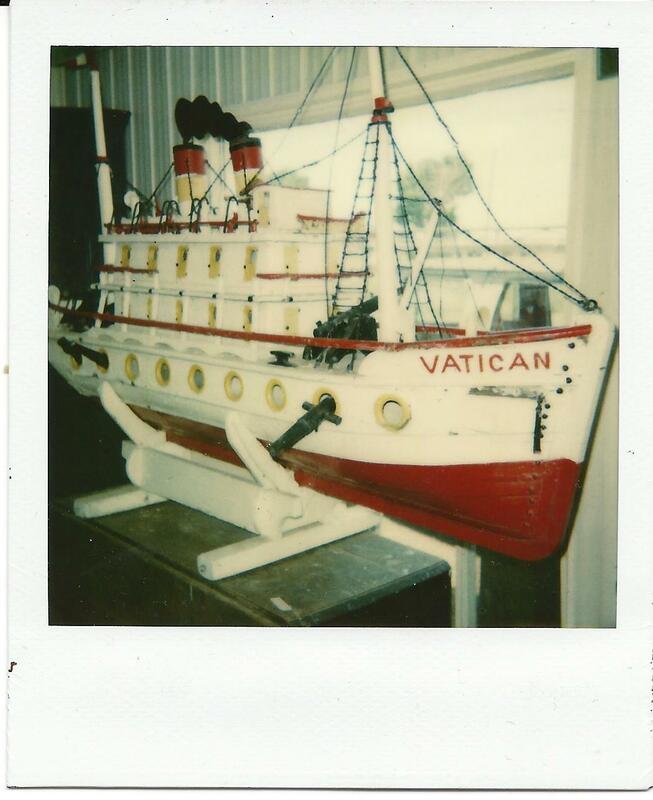 The name “Vatican” painted prominently on the bow. Wow. What a thing. Double masted, with twin funnels spewing black smoke asthe French flag overlooked all from high above. You could see that great care had gone into the creation. Every piece was carved lovingly from wood or shaped from metal, and it was built to last. It was made in the late 1940’s by two priests who taught and lived at the seminary near the town of Lobiniere, situated on the south shore of the St Lawrence river. It took them over two years to make it, and then they mounted it outdoors under a sheltering roof where it served as the home for many birds over the next thirty years or so until the seminary closed. By then the brothers had died, and it was bought by a local. Fortunately, he looked after it well, keeping it painted and maintained and under a roof as the brothers had, so when Kojak bought it, it was just a question of giving it a really good cleaning. This was the state it arrived in hours before I pulled in. It hit all my buttons, had great provenance, and was definitely top drawer folk art, but it was also a lot of money, and huge, not to mention massively heavy. My mind kept telling me to “avoid” “just move away and nobody gets hurt” but when Jean told me he had already called a couple of Quebec city dealers, and they had not committed but would be coming to look at it, I started to panic. Something about it spoke to me. I’m not naturally inclined, but it felt almost Holy. I wanted it, and I had to think fast. “Can I have a hold on it for 24 hours, and take a couple of pictures. I’ve got a guy in mind.” He hesitated. “Well, I don’t want you shopping it around to everyone, but if you have somebody in mind I’ll give you until closing time tomorrow.” Great. That may be all I need. As it happened this was a time when I was selling a lot of folk art to a new, high end interior décor and furniture shop setting up over two floors of a converted warehouse in an up-scale neighborhood in Montreal. The owner, a Mr. Camelot, (how do you forget a name like Camelot), was very progressive and pushing hard to come up with the very best. 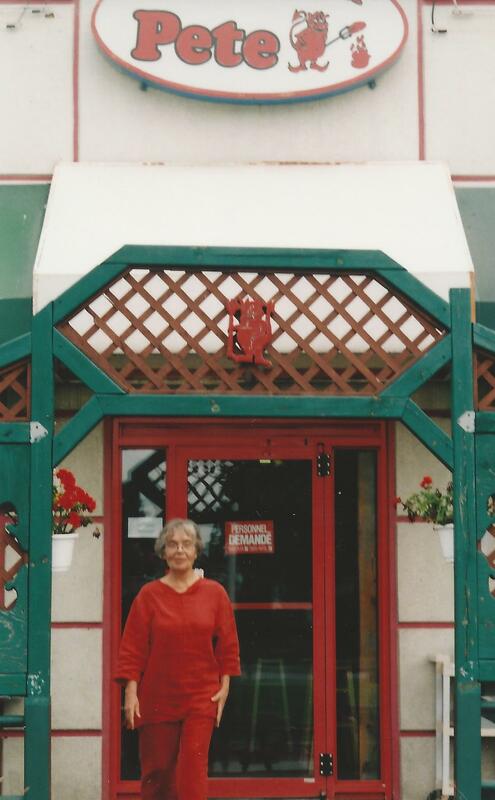 Today I would have phoned him and sent him the picture, but in the day, after he had expressed interest over the phone, there was nothing left to do but drive to Montreal and show him the pictures. The next morning at 8 am we met at the store and he quickly decided based on the two polaroids, and my description that he had to have it, and so it just became a matter of driving the two hours back to Kojak’s and fetching it. I had to pile up the things I already had on my truck at Jean’s because the ship took up the entire box of the truck from front to back. I roped it in place and started out for Montreal. I can remember it as vividly as if it happened yesterday, cruising at 120 klm down Hwy 40 headed for Montreal when suddenly the sky turned black and a torrential summer rainfall let loose. Looking in the rear view mirrors it looked like the Vatican was sailing her way through heavy seas. I was concerned but she was built to take it and there was nothing to do but sail on. 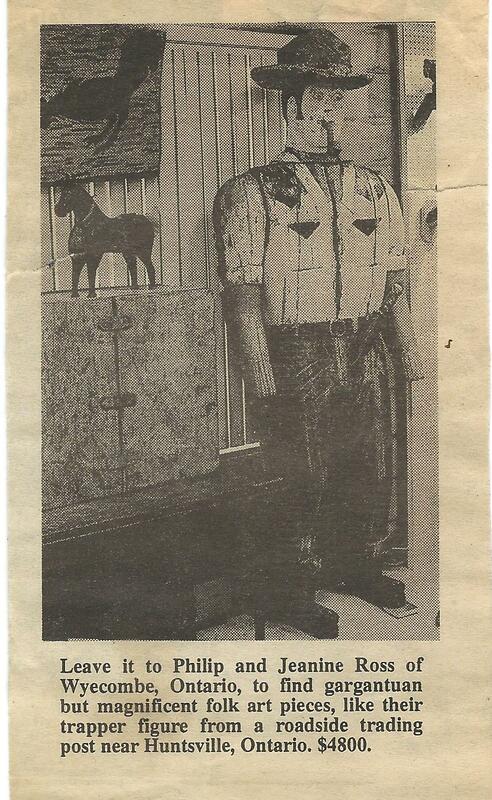 As Mr. Camelot’s workers unloaded it and brought it up in the lift, I was thinking that although I was happy the ship had found it’s new dock, the only unfortunate part was that I would have loved to make it the center piece of our Bowmanville booth that year. Still, a bird in the hand. Something about seeing that ship in those rear view mirrors left a big mark on me, and a little while later I was messing around and found myself painting in a decorative old mirror frame I found, a rendering of the Vatican floating on a cloud off into a starry night . It’s still hanging there on the wall over my left shoulder, and every once in a while I notice it and I think about the two priests staying up late, and using all their leisure time to create such a wonderful home for the little birds.